Is The Fed Considering A Rate Hike In March? A rate hike at next month’s Fed policy meeting is still considered unlikely, but the probability of a surprise is creeping higher, based on Fed funds futures data. 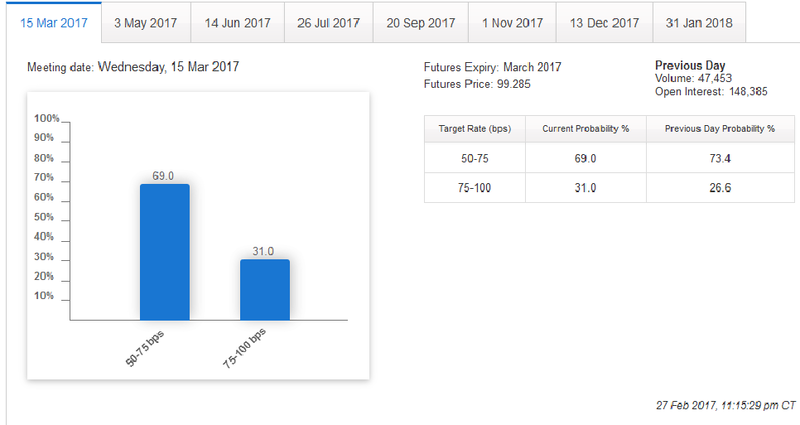 The crowd is currently pricing in a 31% probability that the Federal Reserve will lift its policy rate from the current 0.50-to-0.75% range to 0.75%-to-1.0% at the FOMC meeting on March 13 -14, based on CME data as of Feb. 27. That’s up from an 18% estimate of a rate hike a week ago. By some estimates the odds off a rate hike in March are even higher. President Trump is scheduled to address Congress tonight and analysts will be listening for clues about plans to roll out new infrastructure spending, which is expected to deliver a reflationary boost to the economy. 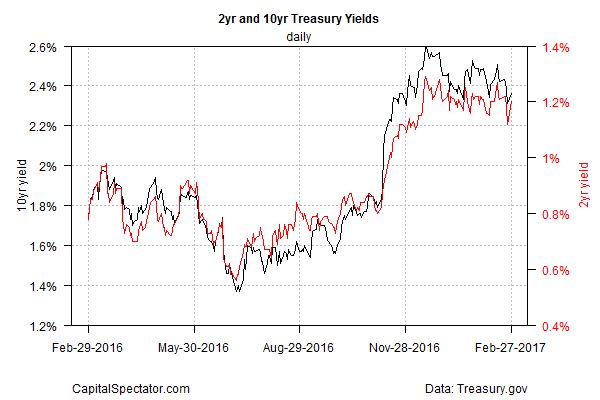 From the perspective of the Treasury market, however, sentiment hasn’t changed much relative to recent history. The policy sensitive 2-year yield rose to 1.20% yesterday (Feb. 27), based on daily data via Treasury.gov, but that’s a middling rate relative to this month’s trading. But with expectations for a firmer pace of economic growth in this year’s first quarter, no one’s willing to dismiss the possibility that the Fed may lift rates in March. The Atlanta Fed’s revised estimate of Q1 growth inched up to 2.5% (as of Feb. 27), based on the bank’s GDPNow model – a modest improvement over the sluggish 1.9% increase in last year’s Q4. The New York Fed’s estimate for Q1 growth is even stronger at 3.1% (as of Feb. 24). Meantime, the government today will update its GDP data for 2016’s Q4 and economists are looking for a slight bump in growth to 2.1% (via Econoday.com’s consensus forecast) vs. 1.9% in the initial estimate. If the forecast is right, the upgrade may boost confidence that the Fed is considering a rate hike in March.